Opinion: Is the new 2017 Porsche 911 RSR really a 911? “Surely that’s a Cayman, not a 911?” remarked one commenter on Total 911’s Facebook page last week when we reported on the official launch of the 2017 Porsche 911 RSR, Weissach’s radical new mid-engined racer. As we all know, the Porsche 911 has always had its engine mounted aft of the rear wheels. From the early 2.0-litre cars right through to the latest 991 generation, the drivetrain layout has been one constant in the Neunelfer’s never-ending evolution. The new GTE class contender completely breaks with that tradition, mounting the engine closer to the centre of the car, with the six-speed sequential gearbox now bolted behind the powerplant via a new magnesium casing. It still looks like a 911, and it still sounds like a 911. But is it really a 911? I’ll admit that the general design sounds a lot like the mid-engined Cayman however, does that mean that the car designed to return the FIA WEC GT crown back to Weissach isn’t really a Porsche 911? Well, no. Over the years, Porsche has always pushed the regulations’ boundaries in its various racing exploits, often using the 911 as its platform of choice. This has meant that many of the 911’s defining features have been tampered with in exchange for faster lap times. For many, the idiosyncratic upright front wings are a 911 signature however, the Porsche 935 famously did away with them in pursuit of better aerodynamics. The ‘flachbau’ front end may have upset purists but there was no doubting that the 935 was a 911 at heart. The Porsche 935 was a genuine 911 (under the skin) but it didn’t look anything like the road cars. Likewise, the 911 GT1 project – running from 1996 to 1998 – saw wholesale changes made to the Neunelfer’s chassis, lengthening it considerably and mounting the engine in the middle (sounds familiar) to provide a better weight balance. Okay, we’ll admit that the Le Mans-winning GT1-98 (with its carbon fibre monocoque construction) was only a 911 in name but, the earlier versions shared some of their front-end design with the 993 road car. More recently, the first generation 991 RSR – launched in 2013 – made the switch to double wishbone front suspension, replacing the MacPherson strut design that is used in the road cars (and has been since the 911’s inception in 1963). The GT1 was the last Porsche 911 to feature the engine mounted amidships with the gearbox behind. Porsche 911s built by the factory to race in the toughest international arenas have, therefore, traditionally broken with tradition in pursuit of greater performance. The new 2017 Porsche 911 RSR (for all the fuss its new engine layout has created) still shares its body shell with the current generation of road cars meaning that, unlike the GT1s of two decades ago, it still looks, unmistakeably, like a 911, and it’s still powered by a naturally aspirated flat six. Rather than questioning whether this is really a Cayman, we should be celebrating that Porsche has decided to stick with the 911 as its RSR platform of choice because it shows that the board back in Zuffenhausen still understands how important the Neunelfer is to Porsche (both the company and the brand). Do you agree with Josh? Is the new 2017 Porsche 911 RSR still a genuine 911? Join the debate in the comments below, or head to our Facebook and Twitter pages now. 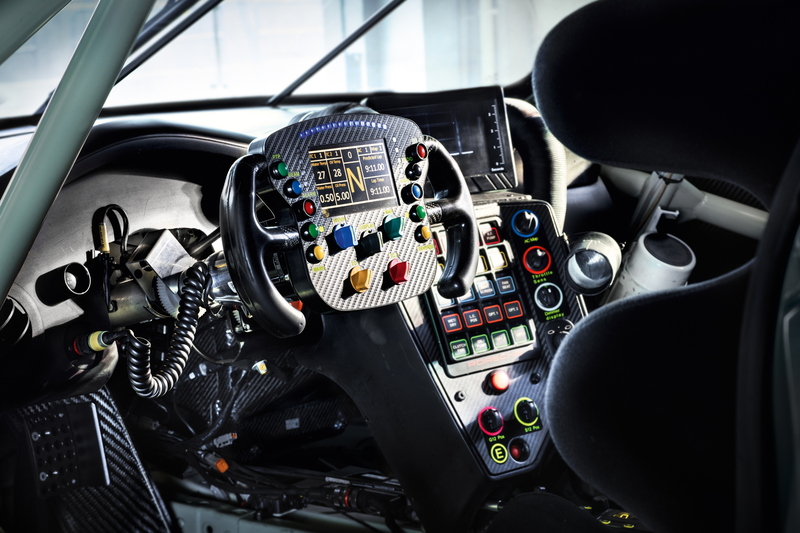 The new 2017 Porsche 911 RSR’s cockpit is an unfamiliar environment for most 911 drivers.